INDIA, Jul, 20 2018 - (JCN Newswire) - The Toyota Mobility Foundation (TMF) and the World Resources Institute (WRI) have initiated a project to deploy two- and four-wheeler rental and ride sharing solutions for congestion alleviation and enhanced first- and last-mile connectivity at six metro stations in Bengaluru, India. Each of the six metro stations will be characterized under distinct typologies based on the land-use and development around the station area. 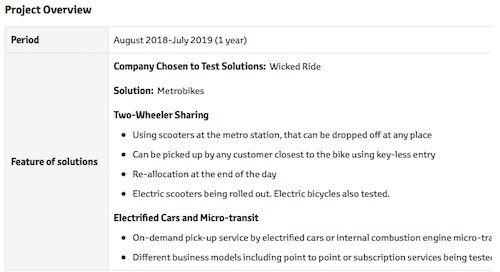 Products made available will include electric scooters with keyless entry, electric cycles, electrified car and micro transit options for ride sharing, with different business models, to better understand what the citizens of the city want. After a 1 year period, findings from these six metro station use cases will be shared with the Government and other interested stakeholders. This project is an extension of the Station Access and Mobility Program (STAMP) initiated by TMF and WRI, from December 2016 through 2017, to facilitate high-quality first and last mile connectivity solutions, through a challenge platform that identifies innovative technologies and business models for mobility. TMF, along with WRI, have also extended STAMP across Indian cities through a 3 year, multi-city initiative, with the next identified city being Hyderabad, in which innovative ideas last-mile connectivity solutions are being recognized and catalyzed. Through these solutions we expect an integrated and seamless mobility experience for the customers by building upon the mass rapid transit initiatives of the Indian government. The Toyota Mobility Foundation was established in August 2014 to support the development of a more mobile society. The Foundation aims to support strong mobility systems while eliminating disparities in mobility. It utilizes Toyota's expertise in technology, safety, and the environment, working in partnership with universities, government, non-profit organizations, research institutions and other organizations to address mobility issues around the world. Programs include resolving urban transportation problems, expanding the utilization of personal mobility, and developing solutions for next generation mobility. Learn more at www.toyotamobilityfoundation.org. World Resources Institute (WRI) is a global research organization, headquartered in Washington DC, that spans more than 50 countries. With more than 450 experts and staff, WRI's global research and on-the-ground experience in Brazil, China, India, Mexico, Turkey and the United States combine to spur action that improves life for millions of people. WRI India works closely with the government, businesses, civil society and other non-governmental organizations, to help solve the four most urgent challenges in India--rapid urbanization, the demand for energy, responding to climate change and the large-scale degradation of natural resources.